Parts 1 through 8 of this series can be accessed from this page. This is Part 9. 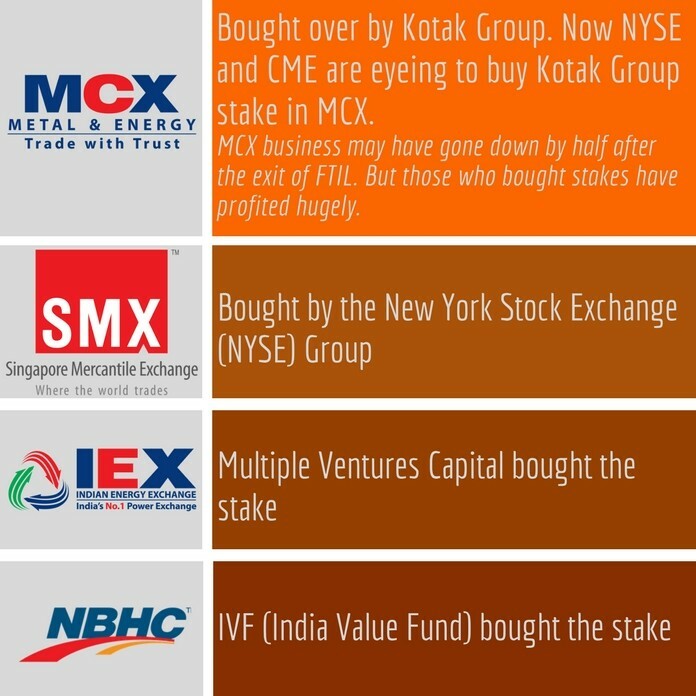 Once MCX-SX got a license to become a full-fledged Stock Exchange, NSE had to move to a higher gear to protect the interests of Chidambaram and the C-Company. In a previous series8, I have written about how NSE allowed co-location at its premises that resulted in a scam of Rs.50,000 crores-Rs.100,000 crores. While the main beneficiaries are being investigated, the fact that most of the accused are card carrying members of the C-Company cannot go un-noticed. The FMC created the crisis and took no action against the defaulters or to resolve the crisis despite having all the powers. C-Company was looking for a weapon to launch against Jignesh Shah and his FTIL group and the NSEL crisis came in handy. 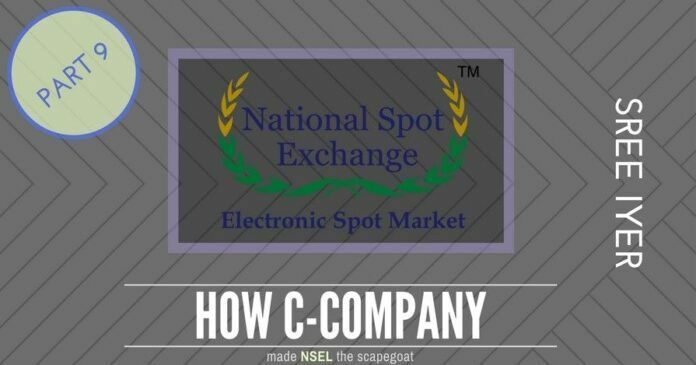 National Spot Exchange Limited (NSEL), which was set up as per the vision of the then Prime Minister, and which has been making rapid progress across the country, was made a scapegoat in order to hatch a conspiracy against the FTIL Group. The Forward Markets Commission (FMC), the then commodity markets regulator, misinterpreted and misrepresented facts to the Ministry of Consumer Affairs, Food and Public Distribution (MoCA) by alleging that NSEL was violating certain terms and conditions pertaining to exemption granted to it under Section 27 of Forward Contracts Regulation Act (FCRA). Though the exemption was general in nature, acting on its evil intentions, the FMC ill-advised MoCA following which it issued a show cause notice to NSEL. Interestingly this happened only after Ramesh Abhishek took over as the Acting Chairman of FMC in August 2011, which in retrospect shows that the pawns were being moved in position to make a strike. 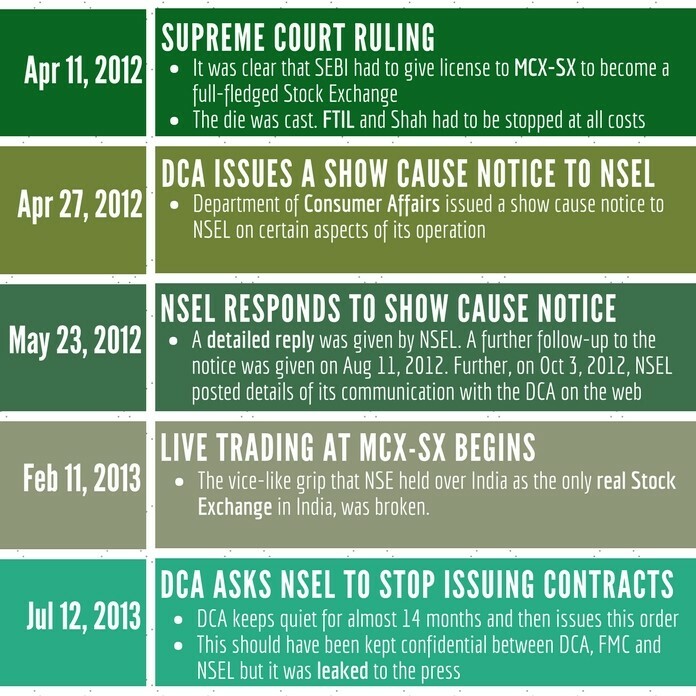 Figure 1 below captures the timelines of MCX-SX getting a license to become a full-fledged stock exchange and the reaction of the C-Company by going after NSEL. Normally regulators intervene when an exchange faces a default. But the NSEL was a running exchange, without any history of payment problem. After the FMC abruptly stopped the exchange from launching new contracts, the defaults happened. The FMC created the crisis and took no action against the defaulters or to resolve the crisis despite having all the powers. The FMC acted only against NSEL, FTIL and Jignesh Shah, initiating all actions against the FTIL Group on the instructions of Chidambaram which were executed through K P Krishnan and Ramesh Abhishek, the then FMC Chairman. The regulator became the destroyer. As the majority of actions by the regulators and other government agencies were concentrated only against NSEL and Shah, the defaulters possibly swindled the goods from the warehouses and in some cases failed to deposit full stock in connivance with Anjani Sinha, MD & CEO of NSEL. Some had already hypothecated certain stocks to banks. In hindsight, it can be said that the hiring of Anjani Sinha as the CEO, given his precedents was perhaps a mistake. But why did FMC stop with just NSEL? Why did they not go after the defaulters? The defaulters, did not honor their part of the commitment. Once the Exchange stopped functioning, and the FMC began pursuing only FTIL, they were emboldened to not only disregard their side of contracts to purchase back the goods, but also did not deliver the stocks. Like SEBI did in solving the NSDL scam, the FMC should have taken a lead role to solve the crisis… The rashness that FMC showed in punishing and penalizing FTIL has not been seen anywhere else. The FMC had failed to act as a regulatory body and was creating a crisis just to spite Shah. It was easily solvable but was deliberately kept alive to target the FTIL Group. A vicious trial by media, with articles blaming Shah and NSEL appeared every day, adding fuel to the fire. On August 4, 2013, the FMC held a meeting of all stakeholders of the NSEL crisis including the defaulters and brokers. The defaulters admitted to FMC Chairman Ramesh Abhishek to holding the entire default amount and even agreed to pay back in a phased manner. In normal circumstances, any regulator after due consultation with the exchange would have endorsed or certified the liability of individual defaulters which could have been followed up for quick payment. This did not happen as FMC chose to be a bystander rather than an active player in bringing the defaulters to book and ensure an early resolution. Seeing the inaction of the regulatory body, the defaulters chose to not adhere to the NSEL payment schedule, as a result of which the money is now with the defaulters who have siphoned it off to buy personal properties and start new businesses. The FMC continued its dilly-dallying tactics vis-a-vis the defaulters and brokers despite the fact that on August 6, MoCA gave it wide-ranging omnibus powers to take such measures as deemed fit against “any person, intermediary or warehouse connected with NSEL.’’ But the FMC trained its guns only against NSEL/ FTIL and their promoters, allowing the defaulters to go scot-free. The RBI, a part of this committee, submitted that the NSEL crisis would not lead to any systemic impact on the markets. Despite this, the Committee asked all investigative agencies including EOW, ED and CBI to take action against NSEL. The RBI also told the committee that the NSEL operations did not constitute a “deposit scheme as per section 45-I (bb) of the RBI Act,” and as such “NSEL was under no obligation to repay the buyers” but the Committee recommended that NSEL be booked under the Maharashtra Protection of Interest of Depositors Act (MPID) by EOW. As a matter of fact, NSEL had not taken any money as ‘deposit’ but the traders had paid it to buy commodities and even paid tax on that. The Committee also ignored the findings of the IT department, that had conducted raids at warehouses of all the defaulters on August 22. The Committee did not even mention the stock verification done by the IT department. The report is based on information made available to it and GT have not independently verified or validated it. It does not constitute an audit under any accounting standards and hence, cannot be relied upon to provide the same level of assurance as a statutory audit. The report is also not intended to be interpreted as a legal advice or opinion. The damage was done. Once the FMC called FTIL not fit and proper, it started reverberating across different countries, where Shah had businesses. He was forced to offload his stake in SMX and other ventures as shown in Figure 2. Previous articleReel life meets Real life in Kerala – One BJP worker dead… Or was it a CPI-M comrade? In any other democratic country, like USA (because most ppl compare with USA for every damn thing) an article with such a details will EXPLODE and the EVERY MEDIA will be all over chiddu and sonia. But in India it is different BECAUSE we have ONLY paid media. Biggest surprise is: why Modi govt doesn’t act? anyway pgurus you guys are doing commendable job and kudos.